Mr. Nishad is our regular customer, he totally bought more than 10 sets of machines from our company since the year of 2015 we met, including large format UV printing machines, eco-solvent printing machines, and small size UV printer. In the past, EPSON DX5 print-heads eco-solvent printer was very popular, but from the experience, the new generation XP600 print-head is better. It has the same print resolution as DX5, but the cost for a new head is much lower than DX5, very cost-effective, only one disadvantage is lifetime shorter than DX5. At the present stage, we are keeping improving our technology and machines, hope to provide more and more quality machines and satisfied service to our customers. His company began as a screen-printing business and has grown to be a full-service sign store equipped with the latest digital printing technology. He trained as a graphic designer and worked while attending college. Early on, he saw the potential eco solvent printing offered, and purchased a WER-ES160 . “We chose WER because we liked the print quality WER delivered,”Nishad said. 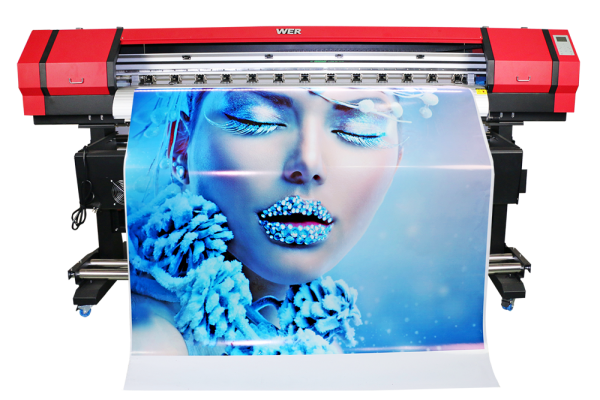 WER-ES160 specializes in Flex Banner, mesh, PVC vinyl, photo paper, PP paper, backlit film, wall-paper,window film etc. His local clients include the police department, and real estate and construction companies. archery equipment and other merchandise. “We like to say that you may not be familiar with our company,but you’ve probably seen our work,” said Nishad. Several years ago, Nishad market his raised designs directly to outdoor enthusiasts of all stripes. “We supply the creativity and we let our WER do the work.” said Nishad.